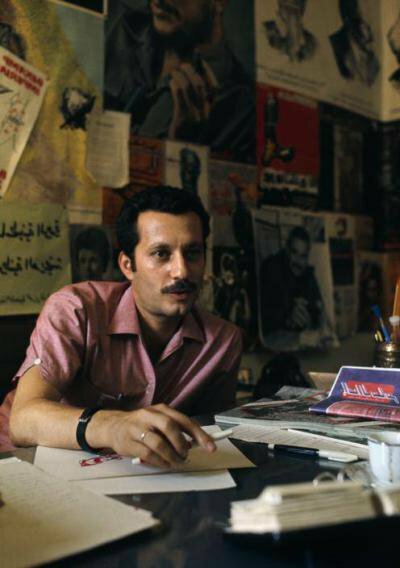 Ghassan at his desk, 1970. Bruno Barbey/ the Palestine poster project archive.Ghassan Kanfani, is undoubtedly one of the most famous and renowned Palestinian writers. Born in Akka in 1936, forced into exile along with his family in 1948, and assassinated in 1972. Ghassan didn’t lead a long life, he was only 36 years old when he was assassinated but his life was filled with the lust for freedom and the word of resistance. My connection to Kanafani was first a geographical one. As a member of the Palestinian diaspora in Kuwait, my introduction into literary resistance and creative resistance was through the writings of Kanafani and Naji Al-Ali’s Handala. As I grew older my father would speak of Kanafani’s work in Kuwait editing Al-Rai newspaper and how he had along with Al-Ali, who was the paper's cartoonist, left their mark in Kuwait and how they were examples for the diaspora to follow. My family was also exiled and had moved to Kuwait in search of a better life. Being a third-generation Palestinian in Kuwait, I had a glimpse of what life must have been like for those Palestinians who had first came to Kuwait but I had no way of understanding the true depth of their plight. I was only truly enlightened into their struggle after reading Kanafani’s Men In The Sun. Kanafani was not assassinated for his involvement with the PFLP. Kanafani was a target because his writings engraved the desire for return in the hearts of many Palestinians in the diaspora. He was assassinated because he was a symbol of resistance, a symbol of creativity despite oppressions. Kanafani said “In blood we write Palestine.” That sentence describes his birth, his life, and his passing. - Anni Kanafani on her late husband Ghassan Kanafani. To me it seems impossible to read the works of Kanafani and not envision the beauty of Palestine. He was and remains one of the strongest and biggest inspirations to Arab writers and to the Palestinian diaspora. His face is one that begs us to return to Palestine, to visit Akka, to write for Palestine. “I went out into the streets of Gaza, streets filled with blinding sunlight. They told me that Nadia had lost her leg when she threw herself on top of her little brothers and sisters to protect them from the bombs and flames that had fastened their claws into the house. Nadia could have saved herself, she could have run away, rescued her leg. But she didn't. No, my friend, I won't come to Sacramento, and I've no regrets. No, and nor will I finish what we began together in childhood. This obscure feeling that you had as you left Gaza, this small feeling must grow into a giant deep within you. It must expand, you must seek it in order to find yourself, here among the ugly debris of defeat. I won't come to you. But you, return to us! Come back, to learn from Nadia's leg, amputated from the top of the thigh, what life is and what existence is worth. -Ghassan Kanafani, Letter From Gaza. When asked about what I want to become, I say that I wish to one day be considered a writer. I could have decided upon a million career paths, a doctor or an engineer, but I was drawn into writing and literature because of Kanafani. I find it hard trying to describe what Kanafani means to Palestine as a whole because his writing was unique in the way it relates differently to every Palestinian. Kanafani can make you dream of a free Palestine in a multitude of ways. A Palestine freed through writing, through song, through poetry, through art, or through a rifle. He was a writer yet it did not define him, nor did it make him dictate resistance through one path. Kanafani wrote resistance and wrote of it, he put pen to paper and highlighted the Palestinian narrative through fiction and reality. “Your mother was still silently gazing at the oranges, and all the orange trees your father had left behind to the Jews glowed in his eyes... As if all those clean trees which he had bought one by one were mirrored in his face. And in his eyes tears, which he could not help hiding in front of the officer at the police station, were shining. -Ghassan Kanafani, Jaffa: Land of oranges. It has been 42 years since Kanafani was stolen from us. Yet if you look for him he has not gone, he is around and inside everyone that remembers him. He is an immortal symbol of resistance. His writings remain some of the greatest works by a Palestinian, by the oppressed, by the exiled. His fragrance emanates every time you open up one of his novels. “In blood we write Palestine.” And in Palestine we write Kanafani.